For the final project in EN 102 (freshman composition) and EN 319 (technical writing), we do versions of the marshmallow launcher project. Students are presented with an imaginary rhetorical situation: The UA Writing Center provides snacks for clients and consultants. They would like to be known as the most congenial department on campus, so they want to provide snacks as quickly as possible. Because the Writing Center is woefully understaffed, consultants can no longer spend time running back and forth, delivering snacks to clients. Thus, the Writing Center needs a marshmallow delivery mechanism that can quickly and easily deliver the yummy snacks from the front desk to any writing center cubicle. The Writing Center will hold a competition to find the best design. 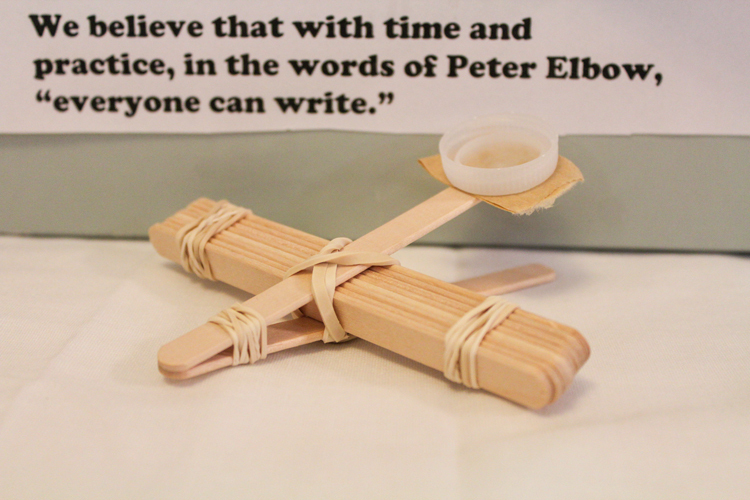 The winning design must be functional (able to launch a marshmallow) and promotional (visually represent the Writing Center in a rhetorically appealing fashion). The launcher serves as a piece of visual rhetoric and must utilize the rhetorical appeals of ethos, logos, and pathos to present Writing Center in a positive fashion. 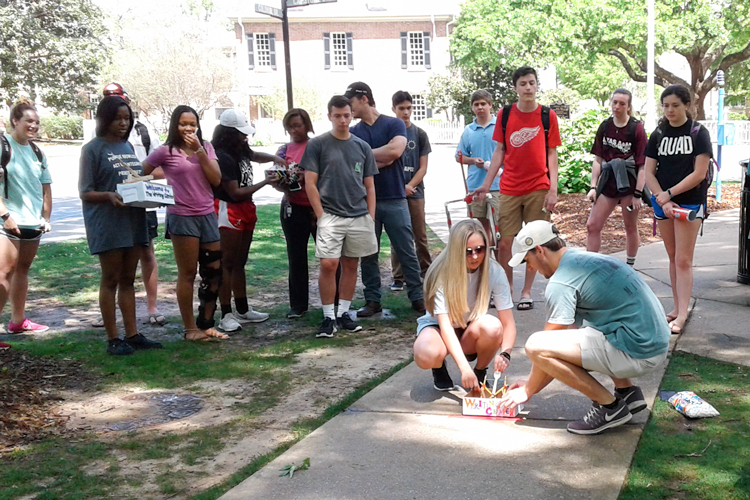 Obviously, EN 102 and EN 319 are not advertising, marketing, or engineering courses, so the construction of Marshmallow Launchers is never the main focus of this project. Instead, the focus is always student writing. EN 102 students compose visual analysis papers and persuasive argument essays. EN 319 students compose resumes and cover letters to apply to an imaginary company entitled Donna’s Company, which performs freelance research for UA-related entities, ethically reports findings, and recommends solutions to problems. After being hired to work for Donna’s Company, students compose business letters, business memos, instruction sets, recommendation reports, and business proposals, hoping to “sell” their marshmallow launchers to UA Writing Center. Both EN 102 and EN 319 students are required to create a website, which serves as an assignment repository, and both courses culminate in a competition day, where students have the opportunity to show off their creations. Please note, again, that this is an imaginary rhetorical situation, imaginary company. No legal tender is ever exchanged. Competition day is for bragging rights only, and I usually feed students pizza and snacks (something other than marshmallows). Donna Branyon is a graduate teaching assistant in the Department of English and a Ph.D. candidate in rhetoric and composition.